Home / .#Politics / France / Riot / Riots / #Politics,#France : Emmanuel Macron has LOST CONTROL of France ! #Politics,#France : Emmanuel Macron has LOST CONTROL of France ! 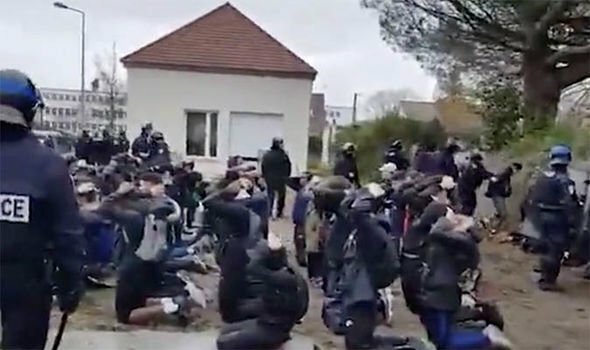 THESE shocking pictures of children with their hands behind their heads, kneeling on the floor and guarded by armed police show the terrifying extent at which Emmanuel Macron has lost complete control of France as riots engulf the country. Child rioters, some as young as 12-years-old, were among 153 arrested at a single high school as violent protests over the President’s policies threaten all-out anarchy in Paris. 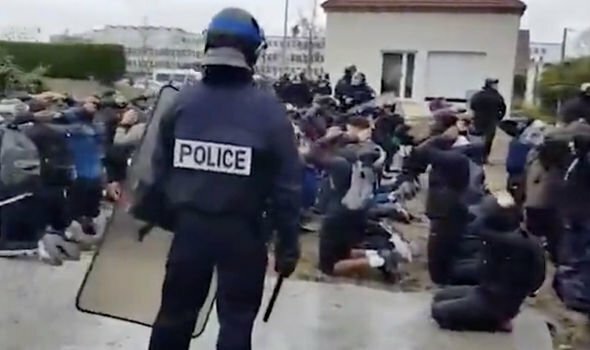 Terrifying footage shows riot police armed with batons guarding the youngsters from the Lycée Saint-Exupéry high school in Mante-la-Jolie - 30 miles west of the capital. The officers are heard shouting at the children and threatening them with violent disorder charges, including "participation in an armed crowd". Some of the youngsters were armed with heavy clubs, baseball bats and teargas canisters. They had allegedly been part of a nationwide day of action aimed at blockading schools and colleges in opposition to reform of the education system, and also in support of the so-called ‘Yellow Vest’ demonstrators. The law enforcement became so great that offices actually ran out of handcuffs, forcing them to take the arrested pupils to a holding area close to the school, before being taken to nearby police stations. On Thursday, the Interior Ministry revealed nearly 280 schools were impacted by the increasing violence, 45 of which were blocked. 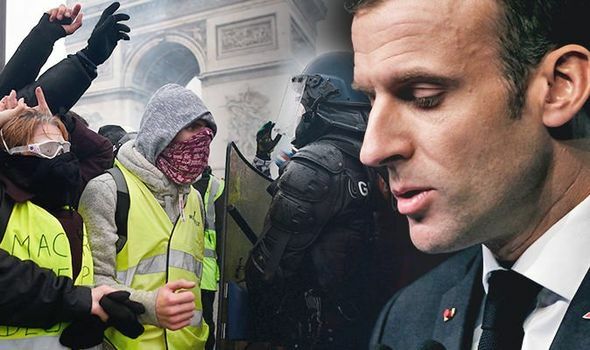 The latest footage will heap yet more shock and embarrassment on Emmanuel Macron as he struggles to control the escalating crisis. A source at the Ministry said: “Some 700 school pupils were arrested across France in connection with high school protests on Thursday. “The most arrests were at the Lycée Saint-Exupéry in Mante-la-Jolie, where there were a total of 153 arrests of pupils born between 1998 and 2006." The Yellow Vest demonstrators, named after the high-visibility jackets all French motorists have to carry, have pledged to continue their violent actions, despite Mr Macron buckling to pressure and performing a U-turn on increasing fuel taxes. Paris was dominated by widespread rioting last Saturday, with more than 400 people arrested and iconic monuments such as the Arc de Triomphe damaged. More shocking images of French police assaulting have also emerged - adding fuel to an already volatile situation. Further riots are expected tomorrow, with 90,000 police set to be deployed to fend off protestors in a desperate attempt to regain control. Mr Macron’s grip on power is hanging by a thread as left-wing groups within the French Parliament discuss launching a no confidence vote against the President. According to an Ifop-Fiducial poll, his satisfaction rating plummeted to 23 percent in November - down six percentage points on the previous month. The 40-year-old leader’s score now matches the low recorded by his socialist predecessor François Hollande in late 2013. Now left-wing parties within the French parliament have agreed to discuss a no confidence vote against Mr Macron’s government. The French Communist Party and the Socialist Party are leading the rebellion. First Secretary of the Socialist Party Olivier Faure wrote on Twitter: “We’ve decided to work together to file a no confidence vote [to the government] next Monday.